This 1600 square foot, smoke-free guesthouse is tucked behind the main 1924 residence in the Los Olivos Historic District in central Phoenix. The guesthouse is hidden in the latest historic district added to the Phoenix register. The Los Olivos district, though tiny, includes 16 houses built on acre lots in the 1910's and 1920's, and is one of downtown's most elite neighborhoods. Enjoy uptown freedom and downtown convenience. The strengths of this rental are design, location and privacy. This spacious setting accommodates 4 comfortably. The interior was designed for a sleek, simple, open feel. The sports and cultural offerings of downtown Phoenix are less than two miles away. 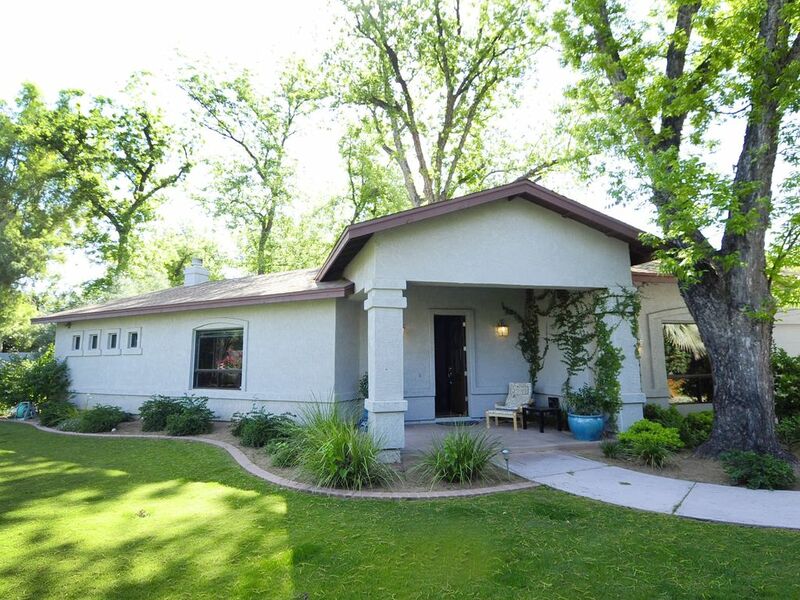 The central location puts any of the valley’s 200+ golf courses within easy reach. This newly constructed guesthouse features upscale, artistic, design throughout - a true labor of love by the owner. The kitchen has granite counters with stainless steel accents and includes high-end appliances. The floors are a cool scored concrete. Nine to fifteen foot-vaulted ceilings provide a free, open ambiance. Both the great room and the bedroom have floor to ceiling granite fireplaces, flat screen HD LED LCD TV’s (55' in Great Room and 43' in bedroom) with 900 channel digital cable (all premium channels included), WiFi, DVD player. Tall french doors open out to the private retreat patio where the grounds are professionally landscaped amongest grand, mature pecan trees and offer uncommon shade and greenery. Browse the Library for a good read or a foreign DVD. A 360 square foot workout room with stair climber, elliptical trainer, treadmill, free weights, Universal Weight Machine yoga mats, hula hoops, jump ropes and color TV, leaves no excuse not to embark on that fitness program. A street scape of palm and olive trees lends a cool, green feeling to a desert city. Within walking distance are a major supermarket, fresh bagels, Starbucks coffee, the best martini in Phoenix, a vegan/vegetarian restaurant, and ethnic restaurants including Vietnamese, Mexican and Peruvian. I am an adventurer...and I travel with VRBO, whether it is paragliding in the Himalayas in Nepal, riding a camel into the Sahara Desert, river rafting in Bhutan, or eating curry in India. My guest house reflects my travels and the love of luxury when traveling. I am fortunate to have many annually visitors that are now friends!! I wanted to create a destination setting, centrally located in Phoenix that is visually stimulating and stylish with comfortable and quite surroundings. It is decorated with the boutique traveler in mind and includes a high-end queen size bed, queen size futon, linens, and towels. The modern decor features innovative local and imported Asian artwork from the landlord's Asian and African travels. This modern yet comfortable retreat is minutes away from the Sky Harbor International Airport, Phoenix Civic Plaza Convention Center, performance art venues and nightlife. You are only a 5 minute walk to the nationally known Heard Museum, the light rail and fine as well as casual dining. The immediate neighborhood is steeped in ethnic, vegan and gluten free restaurants ! Spacious shower with a bench. Sleek copper styling, authentic Asian accents, high end toiletries, and plush towels. Elliptical trainer, free weights. universal gym, yoga mats, jump rope, hula hoops, treadmill and tv... no reason to not train!! Extra large electric-convection oven and glass top stove. Also a cookbook! Multiple appliances: waffle iron, rice cooker, blender, electric tea pot, toaster, skillet, toaster oven. Please let me know if there is something you would like to make your stay more comfortable. Dining table sits in front of large window with a view of lush grass, oleanders, and a large gorgeous blooming ocrhid tree. Monopoly, cards, jango, cribbage, pickup sticks, puzzels and more!! 2 bikes, Helmets required Contract needs to be signed in order to be used. Linda is great so book this place if it fits your needs. A real find. Believe it or not, I chose Linda's guesthouse because I knew it would be perfect for my Shihtzu, Isabel. It turned out to be perfect for me, too. You just have to open the doors and there is a fabulous, meticulously maintained yard and patio for both dogs and people, with tables, chairs and a hammock. The house itself was really clean and well supplied with dishes, flatware, pots and pans and linens. The mattress was good in the bedroom and the futon in the living room was very comfortable for sleeping. I loved the fireplace when it was cool in the evenings. Linda was so prompt and helpful in replying to any questions or concerns. There was a bit of an issue with the wifi in the beginning, but it all worked out. She also shared the citrus from her trees. I loved the location and as a single woman with only a 12 lb. dog for a companion, I always felt comfortable and secure. The house is close to freeways, museums, great restaurants, a wonderful yoga studio and one of the best fish markets (yes, in the desert), I''ve been to. I stayed a little over a month and would absolutely recommend this house -- with or without a dog! Five stars! We very much enjoyed our stay in the beautiful, private and contemporary garden home that Linda, our attentive hostess has creared in one of the premier neighbourhoods of old Phoenix. Linda has flair for design and attention to detail. There is plenty to enjoy in and around Phoenix and the comfortable temperatures plus plenty of sunshine make this an attractive vacation destination at this time of year. Highly recommended. Come spend your vacation at this lovely home. It has all the amenities you could ask for. Enjoy that Feng Shui feeling where you can barbecue or simply enjoy the calm serene backyard and yards. Looking for the perfect spot. This is it !!! The area has become even more vibrant with lots of new restaurants and shops. You will not find a better host. The house has everything you need. The back yard is where you will want to start your day with a coffee and a good book. Walk to the Heard Museum and Phoenix Art Museum, 5 minute walk to fabulous restaurants featuring the best tacos, pizza, Vietnamese, Vegan, Peruvian, old fashion soda bar, Starbucks and beer garden, 5 minute walk to light rail to take you Downtown or east to Tempe and Mesa. Be sure to visit the Botanical Gardens. The security deposit is not refunded if cancellation is not received, in writing 30 days prior to arrival. If you desire to book for a month, no taxes are charged!! VRBO has decided to charge tenants a service fee that is included in your quote. This amount goes to VRBO not to the homeowner. If house rules are violated than your security deposit will not be returned. The $100.00 pet fee is per dog.